The Short-tailed Shearwater, Puffinus tenuirostris, or mutton bird as it is often called, is a member of a group of 60 medium to large seabirds in the family Procellaridae. This family includes petrels and prions among other species. All members of the family have tube-like nostrils on the top of their upper beak and are believed to be one of the few bird families with a well-developed sense of smell. 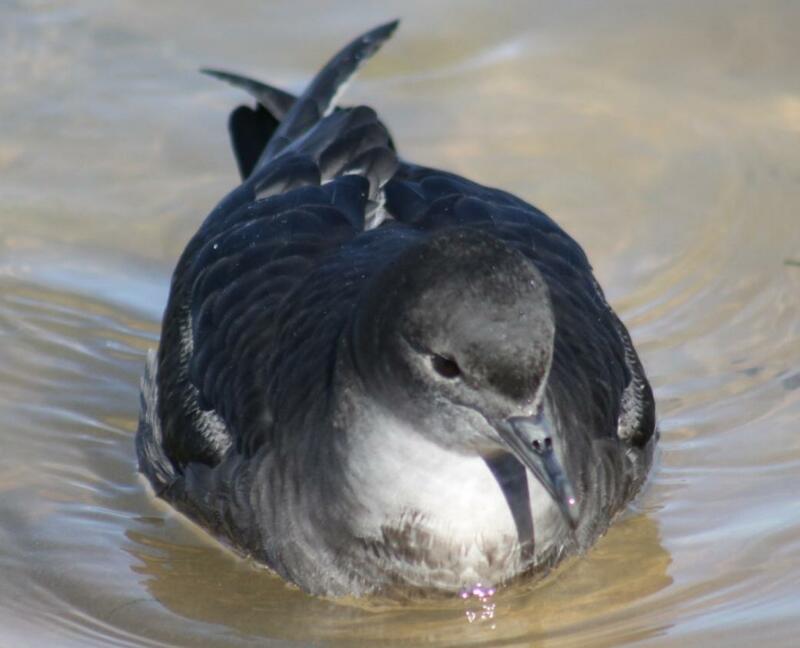 The Short-tailed Shearwater breeds in burrows with 23 million short-tailed shearwaters breeding in about 285 colonies in south-eastern Australia from September to April with eighteen million of these arriving in Tasmania each year. Some sources state the population was much higher, especially in 1798, when Matthew Flinders estimated that there were at least one hundred million birds within a single flock sighted in Bass Strait. There are at least 167 colonies in Tasmania and an estimated 11.4 million burrows. Adult birds have a wing span of about 1 metre and weigh approximately 500 grams. Shearwaters are good swimmers and have webbed feet. Their legs are placed well back on their body and their wings are long and narrow for efficient high speed gliding. These features suit an oceanic existence so the shearwater has difficulty moving on land or taking flight in windless conditions. Shearwaters are often seen floating in large 'rafts' while feeding off the shores of Tasmania. The short-tailed shearwater was first formally described by Dutch ornithologist Jacob Temminck in 1835. He named it Puffinus tenuirostris (tenui ‘slender’, rostrum ‘bill’). The shearwater was recorded much earlier by members of Captain Cook's Third Expedition in 1778 while sailing in the Arctic Ocean. William Ellis, an artist on the 'Discovery' painted the bird. The name 'muttonbird' was first used by the early settlers on Norfolk Island, who each year harvested adult providence petrels (Pterodroma solandri) for food. The petrels were similar to but larger than the short-tailed shearwater. An officer in the Royal Marines called them 'the flying sheep'. Tasmanian Aborigines have also harvested muttonbirds and their eggs for countless generations, and a number of families continue this as an important cultural practice. Unfortunately the providence petrels became extinct following massive harvesting (171 000 birds one year) and the introduction of pigs to the island. The name 'muttonbird' has been applied to the short-tailed shearwater ever since. The common name, shearwater, is an apt reference to their graceful shearing flight moving from centimetres above the water's surface to high in the sky. The diet of short-tailed shearwaters is primarily crustaceans. 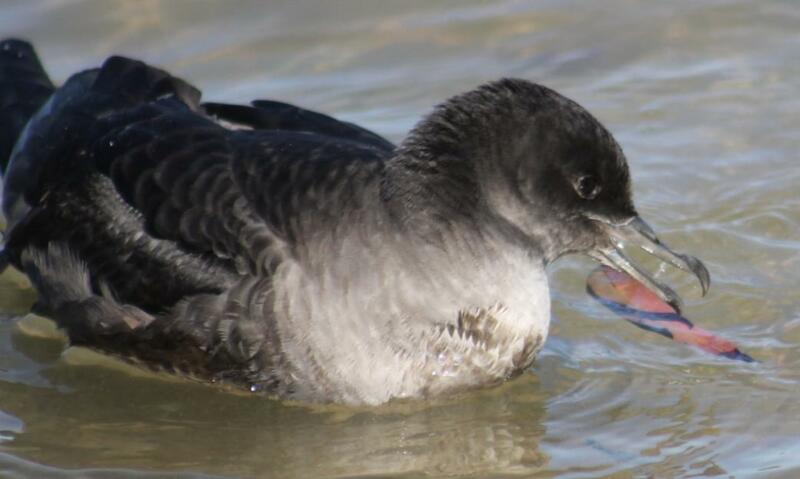 Around Tasmania, shearwaters feast on Nyctiphanes australis, a small (1 cm) crustacean, while in the Antarctic they eat antarctic krill (5 cm). The adults shearwaters return to the colonies at dark after feeding at sea during the day. Short-tailed shearwaters dive to catch their food and can dive to 50 m although the average dive are less than to 20 m. The birds use their wings to propel themselves through the water. The most amazing aspect of these birds is their annual migration of 15 000 kilometres in each direction each year. Their migratory path causes exhausted and starved birds to wash up on beaches of Japan, the Aleution Islands, North America and Australia. Originally this led scientists to believe that the birds flew a figure of eight course across the Pacific Ocean. More recent studies suggest the majority of birds merely fly north along the western part of the Pacific Ocean to the Arctic region and return southwards through the centre of the ocean. They have been known to fly this remarkable distance in six weeks but average around two months for this epic journey. Those shown here are mostly fledglings as shown by their plumage. Adult birds have a darker sooty coloured coat. When the chicks fledge they weigh around 900 g (2 lb), and may be heavier than their parents. On Saturday afternoon (12.10.2013) we photographed these exhausted and starving birds resting in the bay tucked into Station beach at Barrenjoey. Many of these beautiful birds on their first migration do succumb to exhaustion and have appeared in small and large numbers on our Pittwater beaches and in the estuary bay each year. WIRES asks people who find an exhausted shearwater or any other seabird that is still alive to call WIRES on 1300 094 737 or contain in a box and take to the nearest vet. Do not attempt to feed or give water, keep it warm and quiet away from pets and children. These birds cannot fend for themselves and could be attacked by dogs and foxes, leaving them to die of horrific injuries. Developers on King Island have destroyed thousands of burrows in a Short-tailed Shearwater breeding colony at Cape Wickham on King Island. Why? To make way for a golf course. The burrows were due to be occupied by the birds in a few days, as the shearwaters are currently returning to Bass Strait on the return leg of their epic migratory flight back from the northernmost waters of the Pacific Ocean. The islands of Bass Strait form the stronghold of the species, with most of the world’s population breeding there. Each year the birds usually return to the same colony, with most breeding in the same burrows they used in previous years. The colony hosted an estimated 45,000 burrows, of which at least 6000 have been bulldozed to make way for the golf course at the northern end of King Island. Some of these burrows may have been occupied by the same shearwaters for up to 40 years. “It’s going to have an impact on the population,” said Dr Woehler. DPIPWE gave the project its approval on the condition of the construction ‘respecting’ the birds during their breeding season and that an alternative site ‘adjacent the golf course’ is offered as an offset, supposedly providing another area for the birds to nest in. "It beggars belief to think that a wild bird which has nested in one location for many years will happily pick up and settle down 'adjacent the golf course' just because the [King Island] Council, DPIPWE and the developer prefer them to do so,” continued Dr Woehler. “The birds should decide where to lay their eggs and raise their young, not the developers of a golf course”. This situation highlights the folly of allowing developers to use offsets in the pretence that their activities will not adversely affect the wildlife that their developments have displaced. This poor starving bird picked up and shook this gum leaf - clearly wanting something to eat. Estuary, otherwise called Broken Bay, about twenty miles north of Sydney Heads. This island strikingly resembles a lion couchant in its outline, as viewed from Pittwater, its bold sandstone headland facing the entrance to the Bay, while the land falls rapidly westward forming the shoulders, and is rounded off by a gently sloping point which represents the hindquarters of the lion. on Sunday they were on board a launch which conveyed them over the two miles of the Bay to the Island, where they lauded in a sandy cove. The morning was crisp and clear, and a short climb over -sandstone boulders fallen from the cliffs brought the members to the first bun-ows of Fuffinus pacificus, the Wedge-tailed Shearwater. There was little soil amongst the boulders, but a foot or so supported the tangled growth of scrub and trees clinging to the sides of the cliff. breeding habits as its cousin of Bass Strait and Cape Wooloraai, Victoria, Pujfiniis tenidrostris, the Short-tailed Shearwater, the first eggs being laid with commendable regularity on the 26th of November each year, while by the first of December there is not a tenanted burrow without its egg. amongst the countless thousands of dead birds that are washed up on the shores of eastern Australia every year about the end of October. No completely satisfactory explanation of this remarkable mortality has ever been given, although several theories have been advanced from time to time. young birds and eggs are taken by the large lace lizards and hawks. They are not molested by man, so far as could be ascertained. Sydney; Printed and Published for the Society by The Sydney and Melbourne Publishing Co., Ltd., Sydney.